A relaxing non-surgical facial treatment to improve skin texture and appearance and help muscle tone and firmness. For best results a course of 10 -15 treatments is recommended. Microcurrent therapy was originally developed as a medical application to treat facial palsy and muscle tone was restored by applying tiny microcurrent electrical impulses to the affected muscles. During each 1 hour treatment session all 32 facial muscles are gently manipulated using a series of precise movements. 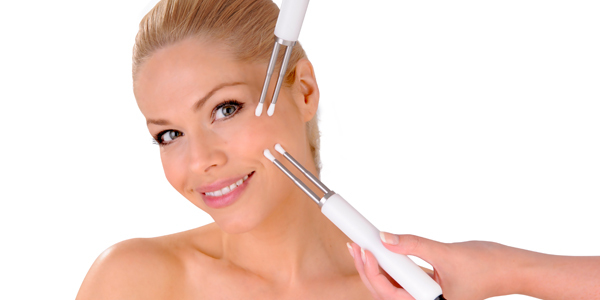 Soft cotton tipped wands are used to transmit the microcurrent to the facial muscles, which restores tone and elasticity. Immediate results are visible, but for best results a course of 10 -15 treatments is recommended. Our skilled team of therapists will provide you with a prescriptive treatment designed especially for your skin’s needs, regardless of your skin type, age or concerns. Includes a highly relaxing lymphatic drainage facial massage, together with a scalp massage, leaving your skin fresh clear and radiant. A superb facial that fills in wrinkles from inside. An extraordinary treatment that works effectively against wrinkles from within, filling in and inhibiting the formation of new expression lines. This facial includes an advanced anti-ageing massage which is highly relaxing and results are visible immediately.